Bottom Line: a nice retro looking speaker that pays homage to a flagship product that has been renowned for its rich and warm sound for decades. Made of actual wood which is not common any more. They’re expensive though, and big and heavy, and they’ll need a decent receiver to power them – definitely aimed for a vintage consumer. Wharfedale is a British audio company that has been around as long as just about anyone. Their Denton speaker, originally released circa 1960, has been a flagship product of theirs for quite a long time, and the befittingly named Denton 80 is a throwback speaker made to celebrate the 80th anniversary of the company. The retro design is immediately apparent, and is indeed aesthetic homage to their generational Denton speaker. The cabinet is made of actual mahogany wood, which you don’t see to much anymore these days as most budget speakers are made of MDF or some other composite material. The baffle is embedded inward, which keeps a bezel exposed on the same plane as the cloth cover. 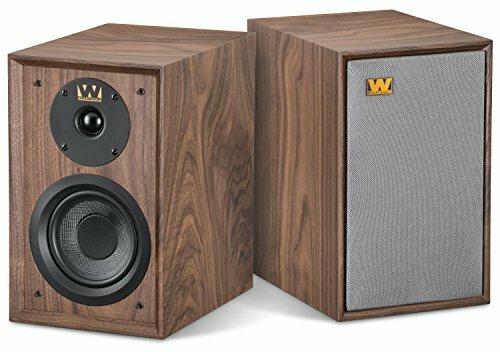 Basically, these relatively large veneered wood speakers scream 1970-80 for those who like the classical look. Beyond that, both the woofer and tweeter have been updated to a proprietary woven cloth blend and a soft dome tweeter. The original Denton has a reputation for its rich and warm sound, and the 80 is definitely aimed to preserve that, as soft/cloth drivers are definitely an ideal choice for that purpose. The specs reflect this intended purpose as well – the power handling and efficiency is relatively low, even with a lowered 6 ohm impedance. You’ll need a decent amount of power for these to truly play even at close/mid range, but, bigger speakers that have more surface area and air to work with will generally sound better. The trade off here is that these will probably not be ideal for louder listening at the full range of a home theater setting. The other trade off is that this speaker is, as we said, quite large and heavy for a near/midfield bookshelf speaker, mostly we’d say due to the cabinet being actual wood. You’ll need almost a square foot of resting space for each of these speakers, plus room in the back for the port to breathe. Wharfedale offers a 5 year warranty on its passive speakers which is pretty top of the line coverage. The Denton 80 is clearly aimed at a vintage consumer that is willing to pay a premium for the large, retro look and a reputable rich/warm sound per the product’s history. That said, it’s a pretty expensive near/midfield speaker. There are many alternative speakers that cost a fraction of the price and would sound about just as good to a layperson, not to mention would likely be a lot smaller and lighter. See the links below for some such alternative recommendations. Ultimately We’d say the Denton 80 comes down to a listening test and personal preferences.